Finish Your Book in Three Drafts (3D), the third book in the Book Architecture trilogy, came accompanied by a wealth of writing know-how in the form of 9 bonus PDFs. We are opening up the vault for the first time and publishing them here: one blog at a time. Behold, PDF #2. Before you get started here you may want to watch THIS VIDEO. When I tour the country, I usually ask the audience to save all questions until the end, but this is one subject where people can’t seem to control themselves. So I wanted to show you some real people. We heard Biz talk about how terrifying it is to toss something out: “What if the best line ever written by a human being is somehow stuck under that pile?” Well, as Ro$hi tells Biz in one of the deleted scenes, “We don’t have anything to fear, because your creativity is inexhaustible.” Besides, forward motion cures many ills. After Wendy cut up her scenes, she was able to move her individual scene names around with more confidence. 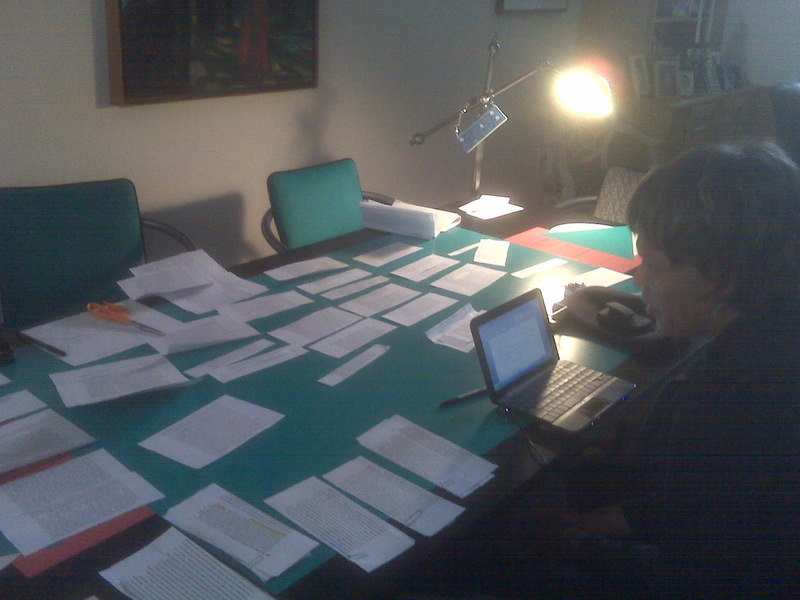 In the foreground you can see her scene list of the good, bad, forgotten, and missing. 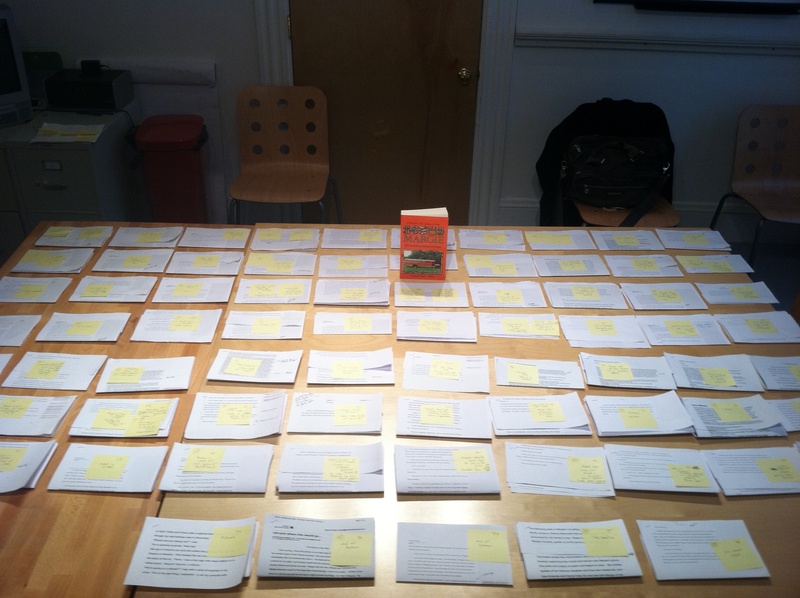 And in the background is her outline, the one she was able to put together after her messy draft—as opposed to those complex outlines done before any work has begun that I have rarely seen truly work. 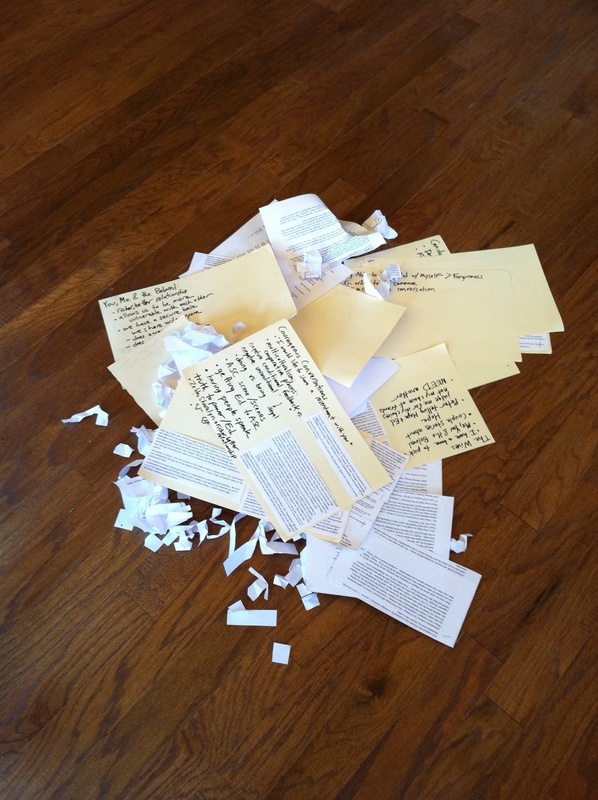 This is the end of Sondra’s process in preparation for her method draft. Her scenes have been grouped and rearranged, and some have been dropped. 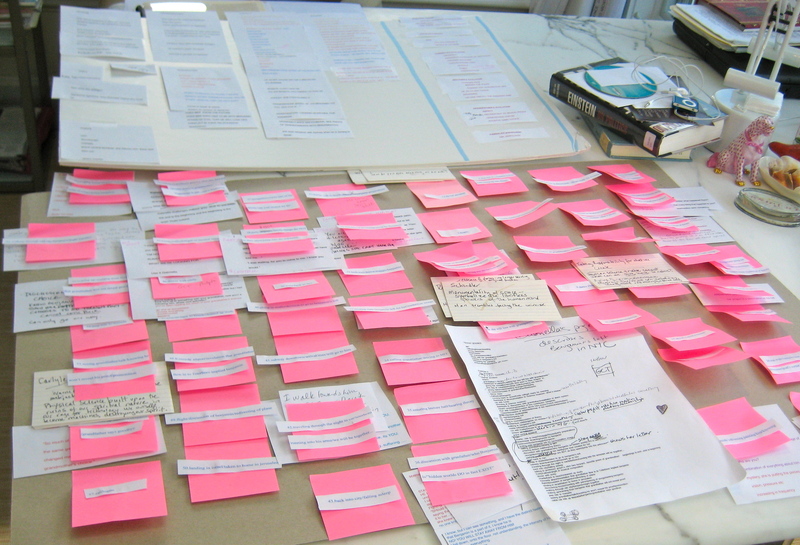 The Post-it notes on top of each scene contain instructions that she wanted to remind herself about when she rewrote each scene. Sondra was writing a memoir about her sister, who died of cancer. When Sondra and I met for the final time to put all of her scenes together, we convened in a room at Grub Street, Boston’s incredible writing center. There was nothing in the room at all except this one book, a poetry collection from a college writing program whose front cover simply read, “MARGIE”— which was Sondra’s sister’s name. I think we both felt at liberty to follow our instincts that day, to trust ourselves to envision the structure a little more deeply.